Blood transfusions nclex questions for nursing: As a nurse you will be transfusing blood and you will want to know how to properly perform this procedure. During a blood transfusion, the patient is at risk for various transfusion reactions like hemolytic, allergic, febrile (non-hemolytic), graft versus host disease etc. Therefore, the nurse must be familiar with how to monitor for these types of reactions, the various blood types, and how to transfuse blood. Don’t forget to watch the lecture on blood transfusions before taking the quiz. 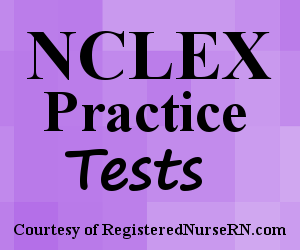 This quiz will test you on the nurse's role with blood transfusions in preparation for the NCLEX exam. A. "Red blood cells help carry oxygen throughout the body with the help of the protein hemoglobin." B. "Extreme loss of red blood cells can lead to a suppressed immune system and clotting problems." C. "Red blood cells help remove carbon dioxide from the body." D. "Red blood cells are suspended in the blood's plasma." A. A patient with O- blood. B. A patient with A- blood. C. A patient with B- blood. D. A patient with AB- blood. A. A 38 year old male who has received multiple blood transfusions in the past year. B. A 42 year old female who is immunocompromised. C. A 78 year old male who is B+ that just received AB+ blood during a transfusion. D. A 25 year old female who is AB+ and just received B+ blood. A. Stop the blood transfusion and administer the IV antibiotic, and when the antibiotic is done resume the blood transfusion. B. Administer the IV antibiotic via secondary tubing into the blood transfusion’s y-tubing. C. Hold the antibiotic until the blood transfusion is done. D. Administer the IV antibiotic as scheduled in a second IV access site. A. Administer the blood transfusion as ordered. B. Hold the blood transfusion and reassess vital signs in 1 hour. C. Notify the physician before starting the transfusion. D. Administer 200 mL of the blood and then reassess the patient's vital signs. A. run the blood at 100 mL/min and then increase the rate after 15 minutes, if tolerated by the patient. B. run the blood at 20 mL/min and then increase the rate after 15 minutes, if tolerated by the patient. C. run the blood at 200 mL/min and then decrease the rate after 15 minutes, if tolerated by the patient. D. run the blood at 2 mL/min and then increase the rate after 15 minutes, if tolerated by the patient. D. Reassure the patient that this is normal and will resolve in 30 minutes. B. Disconnect the blood tubing from the IV site and replace it with a new IV tubing set-up and keep the vein open with normal saline 0.9%. D. Send the blood tubing and bag to the blood bank. 1. Red blood cells are very for vital survival. Which statement below is NOT correct about red blood cells? The answer B. Extreme loss of red blood cells leads to anemia which can cause a patient to experience shortness of breath (there is a decreased ability to carry oxygen throughout the body), tachycardia, fatigue, pale skin color etc. Suppressed immune system can be from LOW white blood cells, and clotting problems can be from LOW platelets. 2. You’re providing care to a 36 year old male. The patient experienced abdominal trauma and recently received 2 units of packed red blood cells. You’re assessing the patient’s morning lab results. Which lab result below demonstrates that the blood transfusion was successful? The answer is C. Hemoglobin levels are used to assess the effectiveness of a blood transfusion. A normal Hgb level for a MALE is 14 to 18 g/dL. For a FEMALE, the level is 12 to 16 g/dL. 3. According to the American Association of Blood Banks, what is the recommended hemoglobin level for a blood transfusion? The answer is B. This is the recent recommendation for by the AABB (7-8 g/dL). 4. What blood type is known as the “universal donor”? The answer is D. Type O is known as the universal donor. 5. What blood type is known as the “universal recipient”? The answer is C. Type AB is known as the universal recipient. The answers are A, C, D and E. The patient must receive blood from either a donor that has O or B blood. Since the patient is B+ (Rh factor is positive), they can receive both negative or positive blood. So, the patient can receive B-, B+, O-, and O+ blood. 7. A donor has AB- blood. Which patient or patients below can receive this type of blood safely? The answer is D. Donors with AB type blood can only donate to others who have the AB type blood, in this case AB- blood. However, they are the universal recipients in that they can receive blood for every blood type but can only donate to their same exact blood type. 8. As the nurse you know that there is a risk of a transfusion reaction during the administration of red blood cells. Which patient below it is at most RISK for a febrile (non-hemolytic) transfusion reaction? The answer is A. A febrile transfusion reaction is where the recipient’s WBCs are reacting with the donor’s WBCs. This causes the body to build antibodies. It is most COMMON in patients who have received blood transfusion in the past. Option B is at risk for GvHD (graft versus host disease). Option C is wrong because this places the patient at risk for a hemolytic transfusion reaction (not febrile). The patient is receiving incompatible blood. However, option D is not the patient at MOST risk compared to option A. Note the patient is receiving compatible blood. Note the patient is receiving compatible blood in this option. The answers are A, B, C, F, G, H, J, and K. As the nurse you want to educate the patient to report signs and symptoms associated with blood transfusion reactions, which would include: sweating, chills, hives, headache, back pain, pruritus (itching), shortness of breath, and nausea. 10. Your patient needs 1 unit of packed red blood cells. You’ve completed all the prep and the blood bank notifies you the patient’s unit of blood is ready. You send for the blood and the transporter arrives with the unit at 1200. You know that you must start transfusing the blood within _________. The answer is C. The blood must be started within 30 minutes. 11. A patient who needs a unit of packed red blood cells is ordered by the physician to be premeditated with oral diphenhydramine and acetaminophen. You will administer these medications? The answer is D. For ORAL medications you will administer the medications 30 minutes before starting the transfusion. The answer is D. If any IV medications will be needed while the blood is transfusing, the nurse will need to start another IV access site. The nurse would NEVER administer the IV antibiotic in the same tubing as the blood product or stop the transfusion. Remember blood is time sensitive and must be transfused within 4 hours. Also, holding the antibiotic is not correct because antibiotics are time sensitive as well and must be administered at the scheduled time to maintain blood levels. 13. You’re gathering supplies to start a blood transfusion. You will gather? The answer is D. This is the type of tubing and solution you will use to transfuse blood. Normal Saline is the ONLY solution used to transfuse blood!! The answer is B. The patient has already received 1 unit of blood and another unit is needed. It took 4 hours for the first unit to transfuse and the nurse needs to obtain new y-tubing for the next unit of blood. Y-tubing sets are only good for 4 hours. Some hospitals require new tubing sets with each unit transfusion or after 4 hours….always check your hospital’s protocol. 15. Before starting a blood transfusion the nurse will perform a verification process with __________. This will include? The answer is B. The nurse will verify with another licensed personnel (another RN) the physician’s order, patient’s identification and blood bank’s information, patient’s blood type and donor’s type along with the Rh factor, expiration date, assess the bag for damage or abnormal substances BEFORE starting the transfusion. D. Administer 200 mL of the blood and then reassess the patient’s vital signs. The answer is C. The patient has an elevated temperature. Any temperature greater than 100’F (before the administration of the blood) the physician should be notified. The answer is D. The blood will be started on an infusion pump at 2 mL/min, and if the blood is tolerated by the patient, it will be increased AFTER 15 minutes. 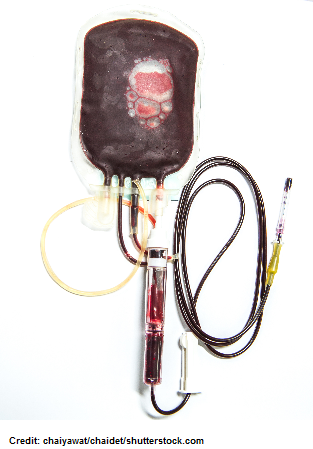 Remember the blood must be transfused within 2-4 hours….most bags are 250 to 300 mL. During the first 15 minutes is when the patient is most likely to have a transfusion reaction. Running the blood slowly during the first 15 minutes allows the patient to receive the LEAST amount of blood possible if a reaction does occur. The answer is A. The patient is possibly having a transfusion reaction. FIRST, the nurse should STOP the transfusion and then disconnect the IV tubing at the access site and replace it with NEW tubing. In addition, have normal saline infusing to keep the vein open. THEN the nurse will notify the physician and blood bank. 19. What solution or solutions below are compatible with red blood cells? The answer is A. Only NORMAL SALINE is compatible with blood. 20. A patient with O+ blood received A+ blood. The patient is at risk for? The answer is C. O+ and A+ are NOT compatible blood types. Patients with O+ can only receive blood from others with O blood. This patient is at risk for a hemolytic reaction. This is where the immune system is killing the donors RBCs. The antibodies in the recipient’s blood match the antigens on the donor’s blood cells….the patient has been mistyped!! The answer is B. This question wants to know your NEXT nursing action. AFTER stopping the transfusion, the nurse will DISCONNECT the blood tubing from the IV site and replace it with a new IV tubing set-up and keep the vein open with normal saline 0.9%. This will limit any more blood from entering the patient’s system. THEN the nurse will notify the MD and blood bank.